Lynn Chadwick is one of the most important and respected sculptors that came to prominence in Britain in the post-war years. Having exhibited alongside Henry Moore, Reg Butler and other young sculptors at the pivotal New Aspects of British Sculpture exhibition in 1952, Chadwick went on to fully establish his reputation when he won the International Prize for Sculpture at the Venice Biennale in 1956. 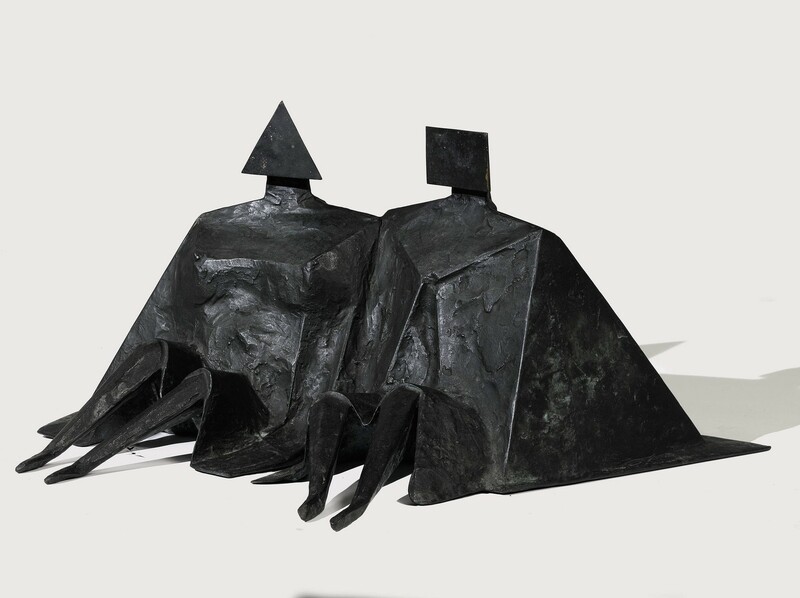 ‘Sitting Couple II’ marks a revival in Lynn Chadwick’s late work of sitting or standing pairs. Often seated on a bench and facing forwards, these couples move away from the light-hearted intimacy of Chadwick’s earlier work in favour of a more composed quality that conveys internal emotion through the slightest change of form. Far from ‘The Geometry of Fear’ which art historian Herbert Read had coined to define the British sculptors of the 1950s, these couples evoke the intricacies of human relationships. In this series Chadwick develops a visual code for the figure, in which the male is always shown with a square head and the female with a triangular. These late couples also build upon the dynamism of Chadwick’s Jubilee works, made during the 1970s in honour of the Queen’s Silver Jubilee. In this series of dynamic figures driving against the force of the wind, Chadwick uses billowing material to suggest volume and movement. In ‘Sitting Couple II’ Chadwick similarly uses taught folds of drapery to convey the curve of the breast and haunches of the shoulders that evoke the gender of each figure. Working from his own foundry, Chadwick was able to explore the potential of bronze as a medium in his mature career, pioneering new techniques for welding and construction. Chadwick rejected the smooth, direct-carved forms of Barbara Hepworth and Henry Moore to create a rougher textured skin. Using phosphoric acid (commercial rust remover) Chadwick could control the tactile finish of his cast bronze sculptures and separate himself from what he considered to be the greasy shine of green and black patinas. In 1981 Chadwick suffered a heart attack and was forced to adopt the help of several studio assistants. While this was a quieter period for Chadwick, with little interaction from the press, Chadwick continued to work with unflagging momentum. In 1985 he was awarded the Officier de l’Ordre des Arts et des Lettres by the French government. Lynn Chadwick's work can be found in the collections of major international museums including the Tate, London; National Museum of Wales; Scottish National Gallery of Modern Art; Musee Nationale d'Art Moderne, Paris; Peggy Guggenheim Collection, Venice; Galleria Nazionale d-Arte Moderna e Contemporanea, Rome; Museum of Modern Art, New York; and the Smithsonian Institute, Washington, DC.